Meet my latest project. It was good, but there’s plenty of room for improvement. More to come. Oh, YUM. Just that snippet has my mouth watering! Cannot wait to hear more details. I’ve been getting called a coleslaw whore lately (seriously? I love the stuff as long as it is homemade. Can not get enough) so coleslaw on a burger is right up my alley. Hey, you tease! That’s just not fair! 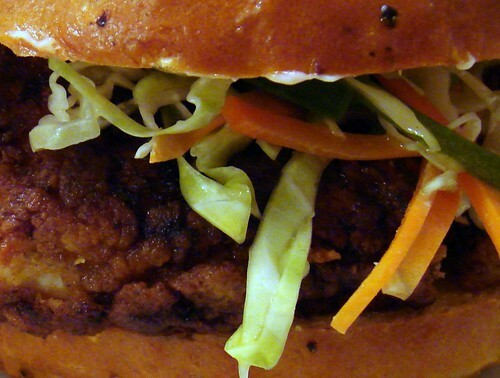 I am guessing it is a buffalo fried chicken burger with slaw. Whatever it is, it looks dee-lish!! Reminds me a Bakesale Betty’s in Oakland. I saw your recipes in Edible Rhody… congrats on the gig. I didn’t get the job, but I’ll be back in the fall for a show in Newport. Now that’s what I call a burger! wont get a burger like that in mcdonalds! Peter – thank you, and we’ll have to make plans to meet up when you’re here in the fall for sure.